These ranches put the giddyup in your getaway. New Mexico guest ranches serve up the cowboy West in a variety of flavors, and welcome families, couples, and solo visitors (aka mavericks) who are game for adventures both wild and mild. Set in northeastern New Mexico outside Cimarrón, the 180,000-acre Express UU Bar Ranch offers custom horse vacations in luxurious Western-style accommodations. A typical day at the ranch might include herding cattle, fly fishing, or riding with an outfitter into the mountains to spot wildlife. For 65 years, Cimarroncita, now a guest ranch in northeastern New Mexico, served as a boys’ and girls’ summer camp. Though today it offers a more refined experience, it still exudes a sense of play. 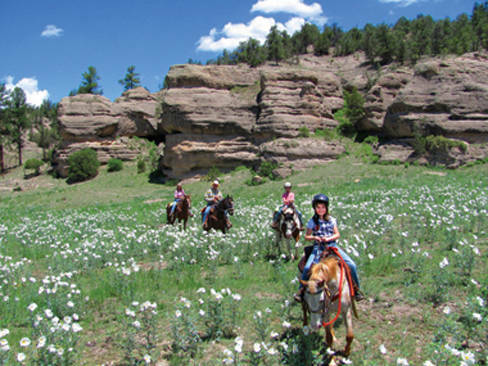 From June 1 through September 30, guests come to fly-fish, hike, and ride horses on 2,500 lush acres of meadow and mountain land. Custom programs may include a leisurely two-hour ride in the lowlands, or a more advanced trek into the backcountry.